High-profile casualties of the election have opened up about the pain of not being reelected. THERE WERE WINNERS and losers after the dust had settled and the final election results were read out last week. Some of the greatest losses were no doubt felt by those TDs who failed to get reelected – having lost not only the backing of their constituents but also their jobs. Speaking this morning on RTÉ’s Sunday With Miriam show, four former sitting TDs and one senator talked about the stress of being a politician, the low points of the campaign and what the future would hold for them. Aodhán Ó Ríordáin (former drugs and equality minister and Labour TD eliminated on the final count in Dublin Bay North). Pádraig Mac Lochlainn (Former Sinn Féin TD who failed to get reelected in Donegal). Jerry Buttimer (former Fine Gael TD eliminated on the final count in Cork South Central). The guests talked at length about their individual campaigns and the support they received from family and friends – as well as their plans for the future. Mac Lochlainn, Buttimer and McNamara expressed their interest to run in the Seanad elections while Ó Ríordáin said that he was also considering a run. Power said that she wanted to stay as senator and would be ‘throwing her hat in’ with the Trinity College nominations. 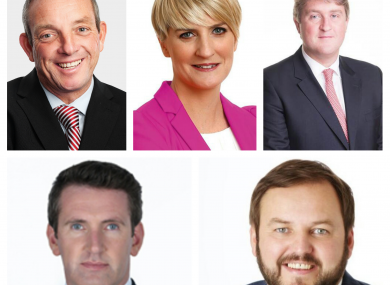 The former Dáil hopefuls also talked about the good points and bad points of political life. So then he turned to the lady beside him and said – ‘you’d want to watch your handbag with him, I think he’s a politician’. However, McNamara said that it didn’t bother him too much as anyone in politics has to have a tough skin. “You wouldn’t be there if you didn’t have some degree of resilience,” he said. Resilience and perseverance was a common theme of the discussion, as was the appreciation each former candidate expressed towards their backroom team and canvassers. “While we’re the public face of the campaign, there’s hundreds of people putting their heart and soul into it in all kinds of weather,” said Pádraig Mac Lochlainn. Mac Lochlainn said that when he realised the tallies weren’t going his way during the race, he had to leave the count centre to re-steady himself. “You’ve got to go away and get your thoughts together,” he said. You can’t be sitting in the counts feeling sorry for yourself, you’ve got to be strong and you’ve got to show leadership. And be mindful that it’s not about you, it’s about the hundreds of people who worked night and day. Mac Lochlainn said that the expansion of Donegal into a full 5-seater constituency (as opposed to the two 3-seaters that it had previously been) meant that he didn’t secure as many votes as he thought he might. Sinn Féin ran three candidates in Donegal – a move many have said was a big mistake by the party. While Mac Lochlainn didn’t quite condemn the move, he did say that if there was another election things would be different. “Whenever people vote, the landscape is absolutely clear, before that you can only guess,” he said. If we had an election in six weeks time we would be able to balance out the votes properly and take that second seat. Jerry Buttimer said that finding out from opinion polls on the run up to polling day that he was likely to lose his seat was “like being hit by a truck at 100 miles per hour”. I’ll never forget, my brother John walked into me and I actually thought my father was dead. That’s what I thought… I said ‘Oh Jesus, what’s after happening here?… and he said ‘I have the opinion poll’. After the shock, Buttimer said that he just had to keep going – canvassing and trying to turn the tide of the election. Averil Power said that at one point during the marathon count at the RDS she thought that she was going to be elected. “Before [Social Democrats candidate Cian O'Callaghan] went out I thought it wasn’t going to happen… and then they started distributing Cian’s votes and my team were tallying them,” she said. She was told that she was ahead of AAA-PBP candidate John Lyons by just six votes and that he would be next elected. However, a mistake was made with the count, and she was actually off by 100 votes. That just shows how crazy it was, it all came down to a few dozen votes. Aodhán Ó Ríordáin confessed on the show that he was so consumed with the campaign that he had forgotten his wife’s birthday, and that while he was in politics everything else took a second position. “That’s what happens, you just get wrapped up in what’s going on,” he said. Ó Ríordáin also spoke of the pain of last Saturday, of watching “good friends” lose their seat and seeing his party decimated. Good friends of mine that I’ve been working with for the past five years, who I’ve been campaigning with and socialising with and gone through the horrible times with… and they’re gone as well… all gone. The guests spoke extensively of their backgrounds and their families and the appreciation that they felt for those who had supported them. The mood was very different from the fierce campaigning and battling of previous weeks, with policies and debates taking a back-seat to a discussion of the former candidates’ personal lives and aftermath of the election. Email “'It was like being hit by a truck at 100 miles per hour' - Former TDs on the devastation of losing their seats”. Feedback on “'It was like being hit by a truck at 100 miles per hour' - Former TDs on the devastation of losing their seats”.